The 4th and final Brackett collection from Haffner Press. Only a few generations ago planetary adventure fiction had a few givens. First, it usually took place in our own solar system. Second, our own solar system was stuffed with inhabitable planets. Everyone knew that Mercury baked on one side and froze on the other, but a narrow twilight band existed between the two extremes where life might thrive. Venus was hot and swampy and crawling with dinosaurs, like prehistoric Earth had been, and Mars was a faded and dying world kept alive by the extensive canals that brought water down from the ice caps. To enjoy Leigh Brackett, you have to get over the fact that none of this is true — which really shouldn’t be hard if you enjoy reading about vampires, telepaths, and dragons, but hey, there you go. Yeah, Mars doesn’t have a breathable atmosphere, or canals, or ancient races. If you don’t read Brackett because you can’t get past that, you’re a fuddy duddy and probably don’t like ice cream. A few of Brackett’s finest stories were set on Venus, but it was Mars that she made her own, with vivid, crackling prose. Here. Try this, the opening of one of her best, “The Last Days of Shandakor.” You can find it in two of the three books featured as illustrations in this article, Shannach — the Last: Farwell to Mars, and Sea-Kings of Mars and Otherworldly Stories. He came alone into the wineshop, wrapped in a dark red cloak, with the cowl drawn over his head. He stood for a moment by the doorway and one of the slim dark predatory women who live in those places went to him, with a silvery chiming from the little bells that were almost all she wore. I saw her smile up at him. And then, suddenly, the smile became fixed and something happened to her eyes. She was no longer looking at the cloaked man but through him. In the oddest fashion — it was as though he had become invisible. Many (but not all) of Brackett’s best, in one volume. She went by him. Whether she passed some word along or not I couldn’t tell but an empty space widened around the stranger. And no one looked at him. They did not avoid looking at him. They simply refused to see him. He began to walk slowly across the crowded room. He was very tall and he moved with a fluid, powerful grace that was beautiful to watch. People drifted out of his way, not seeming to, but doing it. The air was thick with nameless smells, shrill with the laughter of women. Two tall barbarians, far gone in wine, were carrying on some intertribal feud and the yelling crowd had made room for them to fight. There was a silver pipe and a drum and a double-banked harp making old wild music. Lithe brown bodies leaped and whirled through the laughter and the shouting and the smoke. The stranger walked through all this, alone, untouched, unseen. He passed close to where I sat. Perhaps because I, of all the people in that place, not only saw him but stared at him, he gave me a glance of black eyes from under the shadow of his cowl — eyes like brown coals, bright with suffering and rage. I caught only a glimpse of his muffled face. The merest glimpse — but that was enough. Why did he have to show his face to me in that wineshop in Barrakesh? He passed on. There was no space in the shadowy corner where he went but space was made, a circle of it, a moat between the stranger and the crowd. He sat down. I saw him lay a coin on the outer edge of the table. Presently a serving wench came up, picked up the coin and set down a cup of wine. But it was as if she waited on an empty table. I turned to Kardak, my head drover, a Shunni with massive shoulders and uncut hair braided in an intricate tribal knot. “What’s that all about?” I asked. 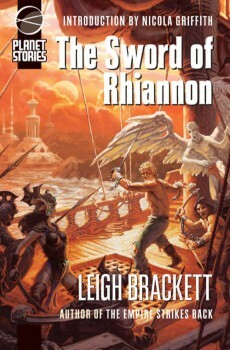 Paizo’s Planet Stories imprint has reprinted a number of Brackett’s best short novels, including my very favorite, The Sword of Rhiannon. Barrakesh is the gateway between north and south. Long ago, when there were oceans in equatorial and southern Mars, when Valkis and Jekkara were proud seats of empire and not thieves’ dens, here on the edge of the northern Drylands the great caravans had come and gone to Barrakesh for a thousand thousand years. It is a place of strangers. In the time-eaten streets of rock you see tall Kesh hillmen, nomads from the high plains of Upper Shun, lean dark men from the south who barter away the loot of forgotten tombs and temples, cosmopolitan sophisticates up from Kahora and the trade cities, where there are spaceports and all the appurtenances of modern civilization. The red-cloaked stranger was none of these. Now it’s possible that you’re a perfectly fine human being if you didn’t find that stirring, but my guess is that if it didn’t interest you at least a little to find out who that stranger was, you’re no fan of adventure fiction. 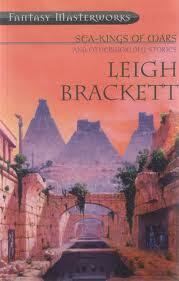 Leigh Bracket was, simply, a master writer. Find her work, read it, and get swept away. An earlier version of this article was posted at Black Gate in 2012. Thanks for posting. Brackett is a good way to start a Monday morning. 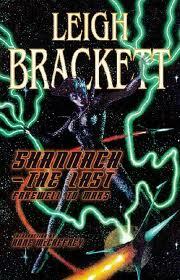 I need to do an extensive Brackett reread soon. Ooohhh – more Brackett is always good. I assumed that only stuff like Alpha Centauri – or die!, The Big Jump, and the Nemesis from Terra and Starmen was left as not yet Haffnered up. There is some good stuff in there. Wait — MORE Brackett?? I await details. Eagerly, even.